You have a wide selection of choices to purchase our honey and honey-related products. We bring our products to a number of fairs. Check our the details below. People find all sorts of fresh, wholesome farm products at farmers markets. So, of course, you’ll find us at many of them. Check out the details in the Farmers Markets section below. Hoosiers love to get together to celebrate and so do we. So you’ll find us at many local festivals. You can find a list of the upcoming events that we will be attending in the Festivals section. You’ll find our products stocked on the shelved of many local retailers. There’s a complete list of stores and locations in the Local Retailers section. Of course, you can always order from our online store. Your order will be filled quickly and delivered to your door. 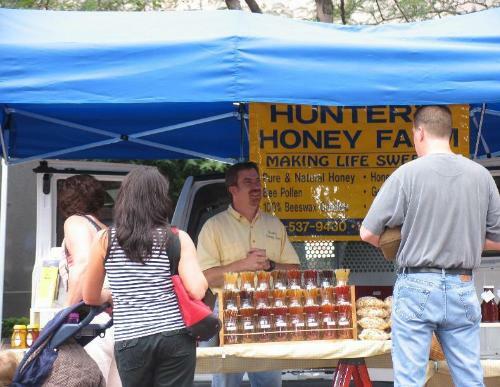 Hunter’s Honey Farm actively participates in these fairs. If you are visiting one of these fairs, please visit our booth. We would love to meet you. Stop by our booth at these local Farmer’s Markets to stock up on our wide array of honey products. Come celebrate with us at these festivals! You will find Hunter’s Honey Products on the shelves of these fine retailers. 27110 St. Rd. 46 W.